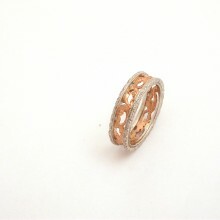 18 carat gold (kt), pink and white gold 5.30 grams (gr). Wide: 0.25 inches (Usa) | 6.00 mm (Italy). Size: 8 inches (Usa) | 17 mm (Italy). Codex: EPT.ss.